I’ve found the perfect picture book for the season. Winter Is Here is written by award-winning author/illustrator Kevin Henkes and illustrated by his talented wife Laura Dronzek. Each page turn of Henkes’ lyrical text walks readers through a gentle snowfall, using delightful words like “falling, sitting, dripping, sticking, reaching, crouching, and settling.” Laura Dronzek’s illustrations, done in soft colors, depict a gorgeous winter wonderland that makes the reader want to jump into each scene and join in the winter fun. The lighthearted tone of Henkes’ text at the beginning of the book changes to reveal the blustery part of Winter. Dronzek’s illustrations follow the mood of the text by creating white and gray scenes, deep blue night skies, and tree branches and chimney smoke bending and swirling in the howling wind. And then, when it seems Winter will stay forever, Henkes gives the reader hope as Winter slowly “shrinks away” and “slows down” to reveal Spring! Grab a cup of hot chocolate and enjoy this feel-good book. The endpapers of the book show mittens at the beginning and flowers and butterflies at the end – a very clever way to demonstrate the passage of a season. If you’re in a quandary as to what to get those little kiddos for the holidays, here are a few book suggestions you might consider. After all, a book is a gift you can open again and again. 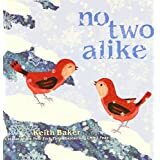 No Two Alike written and illustrated by Keith Baker. Celebrate the season with two birds who take readers on a winter wonderland journey. 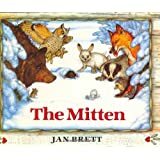 The Mitten written and illustrated by Jan Brett. A lost mitten grows bigger and bigger as one animal after another squeeze into it. To the reader’s delight, an unexpected sneeze sends the animals and mitten flying. Will that lost mitten be found by its owner? Read on and take joy in the beautiful wintry illustrations. 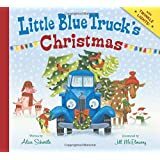 If you like Alice Schertle’s (author) and Jill McElmurry’s (illustrator) Little Blue Truck, you’ll be sure to be entertained by Little Blue Truck’s Christmas! Enjoy the spirit of the holiday with this delightful book. It has it all – rhyming text, animal sounds, counting, one, two, three, four, five, and a tree that lights up. 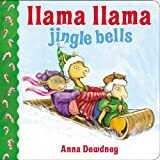 Llama Llama Jingle Bells written and illustrated by Anna Dewdney. Dewdney creates her magic once again in this holiday themed book that includes all the trimmings for a perfect celebration. 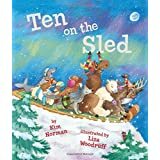 Ten on a Sled written by Kim Norman and illustrated by Liza Woodruff. Join in the fun-filled adventure as ten animals attempt a slippery ride down a snowy hill. Count them as they fall off – 10, 9, 8, 7 … By the time they reach the bottom, there is only one animal left. But don’t despair, all ends well. If you’re interested in a book with a learning theme, you might want to check this out. 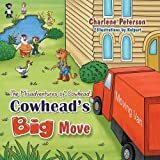 The Misadventures of Cowhead: Cowhead’s Big Move written by Charlene Peterson and illustrations by Kalpart.